What? 10+ years and nearly 3,000 blog posts aren’t enough for you? OK, fine, we’ve got more. 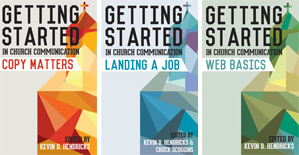 Beyond the blog we’ve got even more church communication resources to help your church communicate better. Launched in 2014, our blog has finally gone auditory. Hosted by Dave Shrein, the Church Marketing Podcast has insightful guests and engaging commentary on how your church can communicate better.